The Framework is the conceptual framework upon which the Ind AS are based and determine how financial statements are prepared and the information they contain. It provides the general principles upon which Ind AS will be based . The framework is the standard of all standards, but is not an accounting standard. It is issued in July 2000. In case of conflict between Framework and Ind AdS, Ind AS shall prevail over the Framework, as Ind AS contains specific principles with respect to items of financial statement whereas framework contains general principles with respect to items of financial statement. concepts of capital and capital maintenance. of an entity that is useful to a wide range of users in making economic decisions. A. Understandability: Information provided in financial statement must be readily understandable by users. B. Relevance: Information has the quality of relevance when it influences the economic decisions of users. The relevance of information is affected by its materiality. Materiality: Information is material if its misstatement or omission could influence the economic decisions of users taken on the basis of the financial information. Materiality depends on the size and nature of the item, judged in the particular circumstances of its misstatement or omission. C. Reliability: Information has the quality of reliability when it is free from material error and bias and can be depended upon by users to represent faithfully that which it either purports to represent or could reasonably be expected to represent. 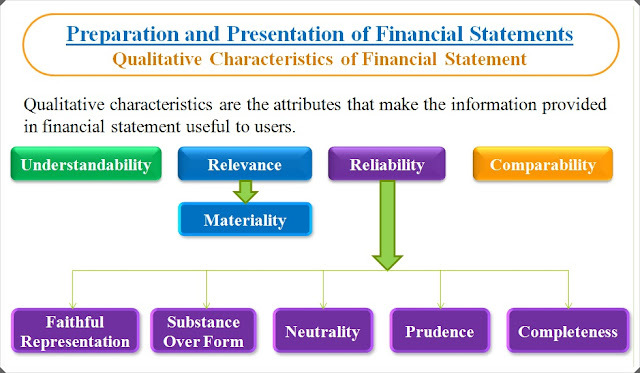 D. Comparability: Financial Statement should be comparable over time within the entity and between different entities. Faithful representation: Information must represent faithfully the transactions it purports to represent in order to be reliable. Substance over form: Economic reality of a transaction, not its legal form (Eg. PPE transferrred but sale agreement not yet prepared). Neutrality: Free from bias i.e. influence the making of a decision or judgement. Prudence: The inclusion of a degree of caution in the exercise of the judgements needed in making the estimates required under conditions of uncertainty, such that assets or income are not overstated and liabilities or expenses are not understated. Completeness: Information provided in the financial statement must be complete. The elements of financial position are assets, liabilities and equity. (a) An asset is a resource controlled (not owned) by an entity as a result of past events from which future economic benefits are expected to flow to the entity. (b) A liability is a present obligation of the entity arising from past events, the settlement of which is expected to result in an outflow of resources embodying economic benefits. (c) Equity is the residual interest in the assets of the entity after deducting all its liabilities. The definition of asset and liability identify their essential features but do not specify the criteria that need to be met before they are recognised in the balance sheet. So asset and liability should be recognised in the balance sheet only when they satisfy recognition criteria. The elements of financial performance are income and expenses. (a) Income is increase in economic benefits in the form of inflows or enhancements of assets or decreases of liabilities that result in increases in equity, other than those relating to contributions from equity participants. (b) Expenses are decreases in economic benefits in the form of outflows or depletions of assets or incurrences of liabilities that result in decreases in equity, other than those relating to distributions to equity participants. The definition of income and expenses identify their essential features but do not specify the criteria that need to be met before they are recognised in the statement of profit and loss. So income and expense should be recognised in the statement of profit and loss only when they satisfy recognition criteria. The definition of income comprises of revenue and gains. Revenue arises in the course of the ordinary activities of an entity and is referred by various names including sales, fees, interest, dividends, royalties and rent. Gains may or may not, arise in the course of the ordinary activities of an entity. Ordinary Activities are defined as any activities, which are undertaken by an entity as part of its business & incidental to main business. Gains represent increases in economic benefits and as such are no different in nature from revenue. The definition of income includes unrealised gains. Gains are usually displayed separately because knowledge of them is useful for the purpose of making economic decisions. The definition of expenses comprises of those expenses that arise in the course of the ordinary activities of the entity and losses. Losses may or may not, arise in the course of the ordinary activities of the entity. The definition of expenses also includes unrealised losses. Losses are usually displayed separately because knowledge of them is useful for the purpose of making economic decisions. Recognition is the process of incorporating an item that meets the definition of an element and satisfies the criteria for recognition in the balance sheet or statement of profit and loss. (b) the item has a cost or value that can be measured reliably. An item that meets the definition but does not satisfy any of the recognition criteria then it will not be recognised in financial statement but disclosed in the notes. a) An asset is recognised when it is probable that future economic benefits associated with it will flow to the entity and the asset has a cost or value that can be measured reliably. These future economic benefits will flow to the entity beyond the current accounting period. b) A liability is recognised when it is probable that an outflow of resources embodying economic benefits will result from the settlement of a present obligation and the amount at which the settlement will take place can be measured reliably. c) Income is recognised when an increase in future economic benefits related to an increase in an asset or a decrease of a liability has arisen that can be measured reliably. d) Expenses are recognised when a decrease in future economic benefits related to a decrease in an asset or an increase of a liability has arisen that can be measured reliably. Assets are recorded at the amount of cash or cash equivalents paid or the fair value of the other consideration given to acquire them at the time of their acquisition. Liabilities are recorded at the amount of cash or cash equivalents expected to be paid to satisfy the liability or at the amount of proceeds received in exchange for the obligation, in the normal course of business. Assets are carried at the amount of cash or cash equivalents that would have to be paid if the same or an equivalent asset were acquired currently. Liabilities are carried at the undiscounted amount of cash or cash equivalents that would be required to settle the obligation currently. Assets are carried at the amount of cash or cash equivalents that could currently be obtained by selling the asset in an orderly disposal. Liabilities are carried at their settlement values, that is, the undiscounted amount of cash or cash equivalents expected to be required to settle the liabilities in the normal course of business. Assets are carried at the present value of the future net cash inflows that the item is expected to generate in the normal course of business. Liabilities are carried at the present value of the future net cash outflows that are expected to be required to settle the liabilities in the normal course of business. Financial concept: Under the financial concept, such as invested money or invested purchasing power, capital is synonymous with the net assets or equity of the entity. Physical concept: Under the physical concept, such as operating capability, capital is regarded as the productive capacity of the entity. This productive capacity may be defined in terms of volume of production. For eg.- Units of output per annum. Under Going concern, it is assumed that the entity will continue in operation for the foreseeable future and has neither the intention nor the need to liquidate or curtail materially the scale of its operations. Under Accrual basis, the effects of transactions are recognised on mercantile basis i.e. when they occur (and not as cash or a cash equivalent is received or paid) and they are recorded in the accounting records and reported in the financial statement of the periods to which they relate. Under Consistency, same accounting policies are followed from one period to another so that comparability of the financial statement can be achieved.